In most states hunting mountain lions is strictly prohibited, but in certain predator management situations it can be permissible. When given the opportunity, lion hunting is a skilled endeavor that can take a lot of guts. Such was the case in Idaho recently on a hunt that was videotaped and posted to the Stuck N the Rut Youtube channel. Ordinarily, mountain lion hunters might tree a big cat to dissuade it from coming back to a certain area, but when it’s deemed a nuisance that’s another story. When a local hunter had some fawns on his hunting grounds killed by a cougar, he decided to take action. The hunter called in a friend with a team of hounds who dispatched the cat with a bow and arrow. 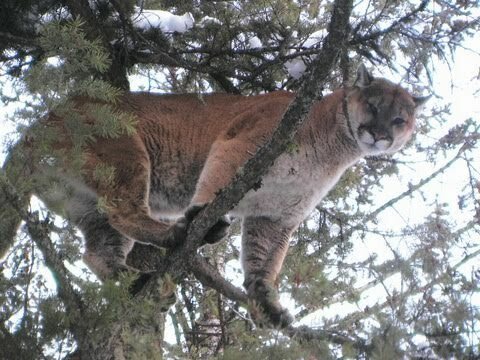 After a fresh snowfall he set out with his dogs to track the mountain lion until it climbed a tree. And at that point he dispatched it with one shot from an arrow. While the actual kill might look easy, the true sport of this hunt is training the hounds, which can take months and even years.